Welcome to our site… We’re so happy you have found us! Please enjoy a thorough browse of the site to familiarise yourself with who we are and what we do. Above all, we are a worldwide community seeking to bring life and light to the orphans and vulnerable children of Mwandi Village, Zambia. Check out our Mission Statement and the Projects and Programs we currently have on-the-go. We’d love you to connect with us on Facebook too! We shall promote an environment in which orphans and vulnerable children are cared for, supported, bodily, mentally, socially, morally, spiritually and with an emphasis on education, nutrition and social support to facilitate a meaningful life. Help Katie continue her ministry at OVC! Feb 5th, 2016 | Comments Off on Help Katie continue her ministry at OVC! Apr 12th, 2015 | Comments Off on KT Newsletter No 1! Dec 13th, 2014 | Comments Off on Merry Christmas! 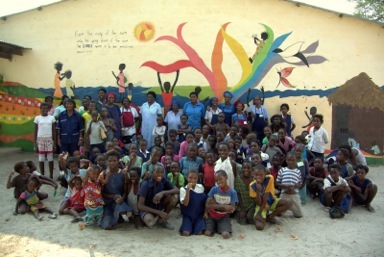 The Mwandi United Church of Zambia Orphans and Vulnerable Children Project was established in 2005 to support the orphans and vulnerable children of Mwandi Village educationally, nutritionally, socially and spiritually. The Project seeks to be inclusive of all children without prejudice of religious affiliation, background or illness. The Project aims to welcome vulnerable children from all parts of Mwandi regardless of their background or history. In Mwandi, 20% of the general population are HIV positive, with a child population of approximately 3000, of which almost two thirds are orphans or considered to be vulnerable. The Mwandi UCZ OVC Project currently attempts to mitigate the effects of these startling statistics in a number of ways. Please visit the ‘About OVC’ tab to learn more about our specific Programs.